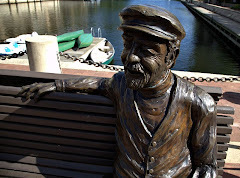 Restonian: News blog from Reston, Virginia, the mauve-colored New Town (tm): Happy Birthday, Bronze Bob! One advantage of creating a mauve-colored New Town out of whole cloth and oil company money: Your birthday becomes a pretty big damn deal. As Reston celebrated its 44th birthday and founder/Dear Leader Robert E. Simon celebrated his 94th birthday on April 12, he unveiled his long-rumored reverse-Midas touch, transforming himself into mauve-colored gold at the touch of two Lake Anne water mold sprites. Then everyone had cake. Hooray!